Electric carmaker Tesla said it would reduce its workforce by 7% after the "most challenging" year in its history. 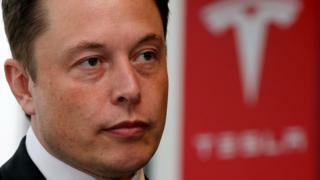 In an e-mail to employees posted on the company's website, founder Elon Musk said the company's growth had been strong. However, he added that the company's cars were still "too expensive for most people" and the road was "very difficult". The company currently employs more than 45,000 people, which means over 3,000 will be laid off. Mr. Musk said 2018 is Tesla's "most successful" company to date, delivering nearly as many cars as in all previous years of its existence. As it raised the production of its mid-size model car 3, however, it said its products were too expensive for most people and the profits were too low. "This quarter will hopefully allow us to make a tiny profit with great difficulty, effort and luck," he wrote. "However, from about May we will have to deliver at least the middle model 3 version in all markets as we have to reach more customers who can afford our vehicles. "In addition, we need to make further progress toward more favorable variants of Model 3." He said that because of the company's challenges, Tesla has "no choice" but to reduce the number of full-time employees and retain "only the most critical contract workers and contractors." He added that the company would have to make these cuts while "increasing the production rate of Model 3" and making many "manufacturing improvements in the coming months".